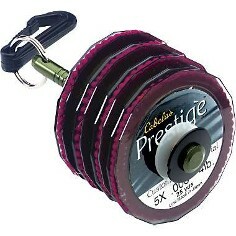 One of the fly fishing supplies you’ll need on your person at all times is tippet. The tippet is the fine end of the leader where the fly is tied. Once you bust that off a few times, you end up tying on new tippet you buy on a spool. If you set yourself up with a 9 foot, 3x tapered leader, you’ll get one suitable for the average stream, where 30-40 foot casts are the rule, and with a tippet fine enough to handle fly sizes No.10 to No. 14. If you need to go smaller, tie on tippet from a spool in decreasing size. See – no big mystery. The bigger the tippet numbers the bigger the fly number – which is to say, smaller tippet: smaller fly. Fly Fishing Supplies Note: What is fluorocarbon tippet? 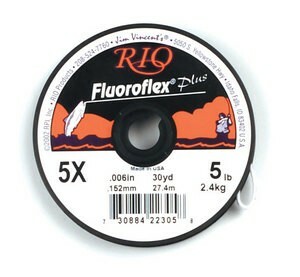 Fluorocarbon Tippet Material is made from a material having the same light refraction as water. It virtually disappears in the water, making it impossible for the fish to detect. The hard, smooth surface of fluorocarbon creates less friction and heat on the material as you tighten your knot, therefore knots are stronger. Sound good? It better be – it’s about twice as expensive as monofilament!